I am always on a look out for good and easy crockpot recipes. 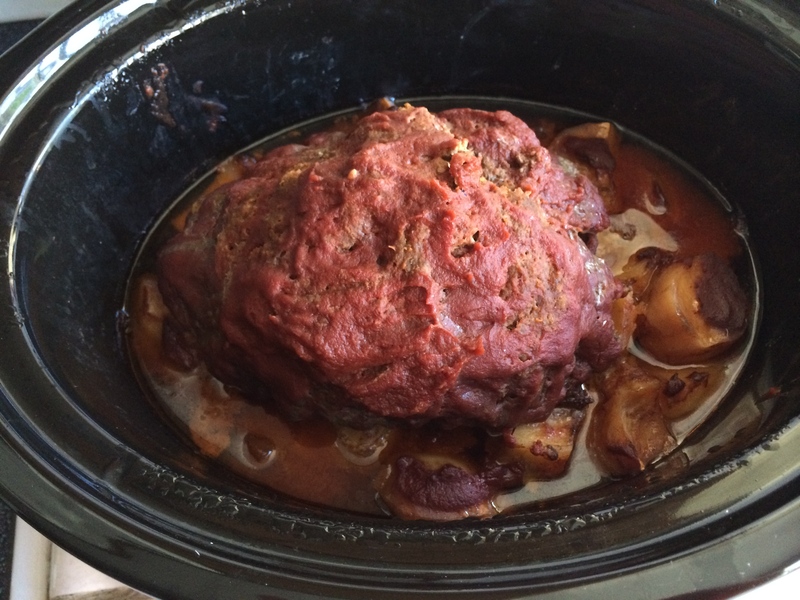 For me, there is no point in cooking something in the crockpot if I have to brown it, or fuss around it, or add something in the last hour or half-way through. I want to throw things in, turn the crockpot on and be done. I also look for recipes that use real food. No cream of chicken soup please, or any other processed stuff. Lastly, a meal has to be reasonable in carbs. This recipe for GF meatloaf met all of the criteria and I was eager to give it a try. I was intrigued that the recipe suggested using instant potato flakes instead of bread crumbs. However, since I had neither instant potatoes nor GF bread crumbs, I opted to buy bread crumbs so that I could have them in the pantry. I nearly doubled the amount of ground beef but did not need to increase the amount of any other ingredients. I added a little bit of ketchup to the meatloaf, but next time I will skip the milk and just use more ketchup. I like to have my meatloaf a little sweeter inside. Instead of separate spices I grabbed my trusty Italian Seasoning mix, which has all of the spices listed plus some more, and I used a generous amount without measuring it. Lastly, I generously sprinkled potatoes with salt. I learned the hard way how much potatoes absorb salt and flavor and did not want to have a bland meal. It took me more than 15 minutes to prep everything, but no more than 30 minutes. It was easily. I had been a little concerned about over-cooking the meatloaf, as I’ve had several experiences of following recommended cooking times and then realizing I should have done one or two hours less. So I cooked this meatloaf on low for 6 hours. I happened to be at home when it was done and tasted it right away. It was fully cooked but I thought it would be better a little softer, so I added another 30 minutes, after which it sat in the crockpot for about two more hours before we ate it. It was delicious and everyone in the family loved it. Next time I make it, I will cook it for full 7 hours to make it just a touch softer. Figuring carbohydrates involved a little bit of estimating because it is difficult to cut up the meatloaf into equal servings and I did not measure all of the ketchup I put in. Between sugar, ketchup and bread crumbs, I figured that carbs added up to about 100g. for the entire meatloaf. I cut up the meatloaf into 8 generous servings, so we went with the 12 g. estimate per serving. Since V’s BG reacted normally, it proved to be a fairly accurate estimate. We measured out potatoes separately and, by the way, they tasted really good too. Adding salt to them made a big difference. The final product! It’s shaped a little bit like a brain. Perhaps next time I should shape it like a pancreas?